Games accounted for 75 per cent of total spending in the iOS App Store while snagging a third of all downloads over the past 10 years. That’s according to App Annie, which has compiled a report looking at the last 10 years of the iOS store. Total downloads surpassed 170 billion between July 2010 to December 2017 with games pitching in around 52.7 billion. Total consumer spend meanwhile hit $130 billion during that period, with around $97.5 billion coming from games. Over the time period the Asia Pacific region has swelled to provide the biggest share in downloads and consumer spend. In 2017 alone consumer spend amounted to $42.5 billion with $25.2 billion of that coming from APAC. The region also provided 49 per cent of the 30.5 billion downloads for the year. While the APAC region has roared into the lead over the years the U.S still comes out on top when individual countries are considered. Over the past 10 years the US has racked up 40.1 billion in downloads and generated $36 billion in consumer spend. China meanwhile followed close behind with 39.9 in downloads and $27.7 billion in consumer spend. 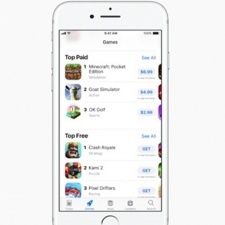 The report also found that nearly 10,000 apps generated more than $1m in consumer spend. Looking forward, App Annie is backing spend to reach $75.7 billion by 2022, which would be an 80 per cent increase from 2017.